The Ithaca 154 has been discontinued. No direct replacement is available. 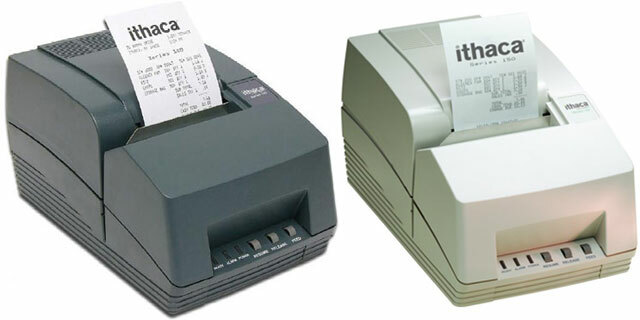 The 154 offers affordable receipt & validation printing for all of your applications. Impact, single-color receipt & validation printing, 9.5 lps, USB interface. Includes power supply. Order cables separately. See accessories. Color: white. Impact, single-color receipt & validation printing, 9.5 lps, serial interface. Includes power supply. Order cables separately. See accessories. Color: white. Impact, single-color receipt & validation printing, 9.5 lps, parallel interface. Includes power supply. Order cables separately. See accessories. Color: white. Black Ribbon Cartridge for 50, 150, and 90PLUS Series Printers ONLY. 12 per case.